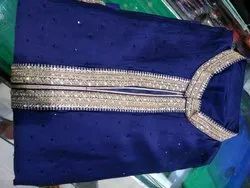 Glorifying the look of evening glamor, our vast assortment of Ladies Suits is hugely appreciated by our clients, and is preferred nation wide. These are created in wide variety fabrics, including cotton, silk satin, crepes, Georgette and many others. Our designed suits present a never before fusion of traditional and contemporary designs, and are offered at industry leading rates.